The U.S. Army that has been fighting desert wars for at least 15 years—25 years, if you look back as far as the First Gulf War—has finally created a training course for this arid environment. The three-week Desert Warrior Course at Fort Bliss, Texas, focuses on lessons about surviving in blistering hot sun and frigid nights that are well-known to Iraq and Afghanistan veterans. It also includes vitally important lessons in small-unit tactics and leadership. The training course was launched last summer under the auspices of the 1st Armored Division’s Iron Training Detachment. It is modeled on the Army’s other environmentally themed training courses: the Jungle Operations Training Course in Hawaii, and the Cold Weather Leaders Course in Alaska. While the cold, jungle and desert settings are unique, Capt. Daniel Plumb, Iron Training Detachment commandant, said the courses share a strong common core that cannot be overvalued: leadership training in direct-action combat skills at the team and squad levels. Underlying that purpose, he said, is a recognition that the constant, years-long churn of deployments focusing on counterinsurgency has eroded basic combat leadership skills at that critical ground level. Spc. Dylan Pike, a licensed vocational nurse with the 31st Combat Support Hospital at Fort Bliss, went through the most recent Desert Warrior Course. He admitted to having a bit of an edge coming in; he served as a staff medic for a previous course run. “I was thinking it would be mainly a survival course, but it was much more about tactical movement and battle drills,” said Spc. Renee Castillo, a field artillery surveyor with Headquarters and Headquarters Battery, 4th Battalion, 27th Field Artillery Regiment at Fort Bliss. “But in that sense, I guess it was a survival course, surviving tactically in the desert,” she said. The course, which has been offered quarterly since last summer and wrapped up its fourth run in late April, is built on a “crawl, walk, run” model, with those descriptors pinned to the first, second and third weeks of the training. The “crawl” phase is classroom instruction and practical exercises designed to get a student body with myriad job specialties “on the same sheet of music,” Woodberry said. The second, or “walk,” week gets into what one student called “the fun stuff,” when the course moves onto the Fort Bliss range that covers nearly 1 million acres stretching into New Mexico. This phase kicks off with a live-fire exercise that gives the students’ marksmanship skills a workout, to include having them shoot with their nondominant hand. The next day, students board a helicopter and fly to a remote part of the range for advanced desert land navigation instruction—without benefit of that handy gadget called a GPS. Students in the Desert Warrior Course are limited to simple tools to navigate. “We land them in a barren area; give them a map, a compass and a protractor; and tell them to figure out where they are and then move to a specified point based only on terrain association,” Dunham said. The “no GPS” rule for that exercise is jarring for some students who have come of age in the era of technological proliferation. But Dunham, a veteran of two deployments to Iraq and one to Afghanistan, said going back to basics serves a purpose. 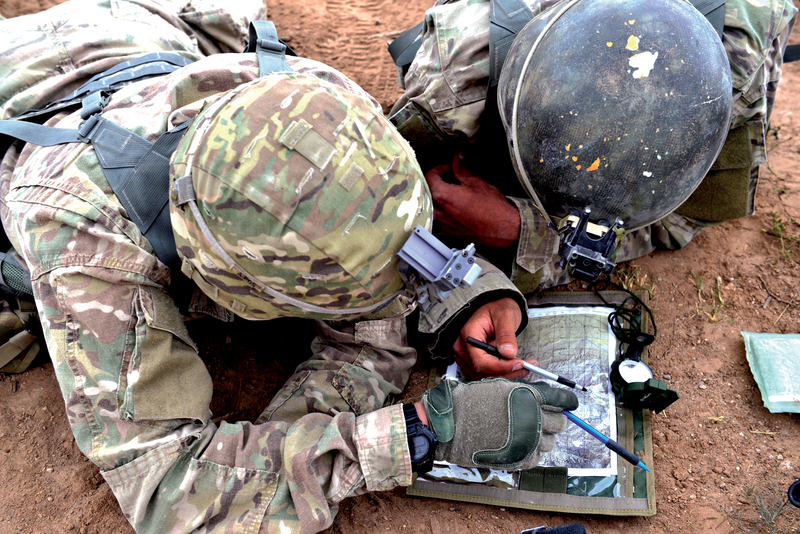 “In Afghanistan, even though I had GPS, I still had to pull out my map and get a fix on where” the enemy was, he said. The second week also rotates students through multiple desert survival training lanes such as building shelters; starting fires; finding, collecting and filtering water; and setting snares and traps to catch food. They also are visited by staffers from the West Texas Regional Poison Center to be briefed on desert plant and animal life. 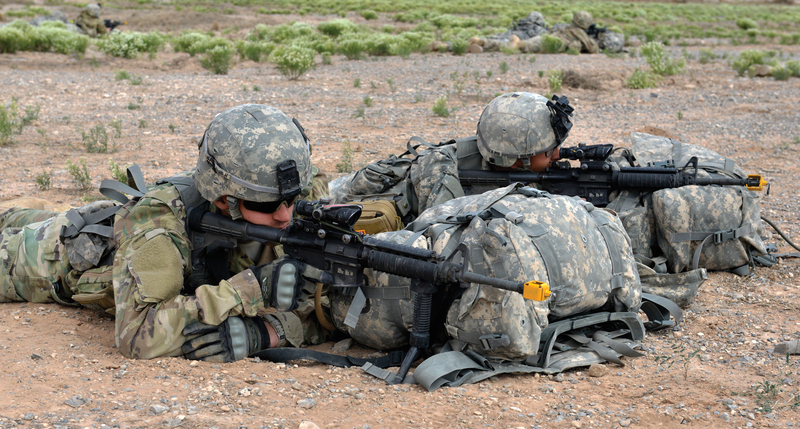 The final week—the “run” phase—is dominated by a 72-hour field training exercise (FTX) that is largely free-form, with students divided into squads for clashes with an opposing force of troops from a permanent-party unit at Fort Bliss. That final training exercise “was a smoker,” Pike said. “We were split into two squads and basically told to survive for four days using what we had been taught earlier in the course, eating only one MRE a day. We were launching ambushes” and getting ambushed, with two or three contacts daily with the opposing force. The course’s 11 instructors are all well-suited to their training environment; each has notched multiple deployments to Iraq and Afghanistan. Instructors are hand-selected, “plucked out of their units because they’re intelligent and motivated,” Plumb said. And there is no shortage of enthusiasm. “Being an infantry guy, I love this,” said Sgt. 1st Class Karl Christian, a Desert Warrior platoon sergeant who counts five trips to the Middle East and two to Afghanistan among nine total deployments in a career that recently passed the 20-year mark. The instructors’ affinity for field training dovetails neatly with that of the students, who have embraced the unique aspects of the course, Woodberry said. 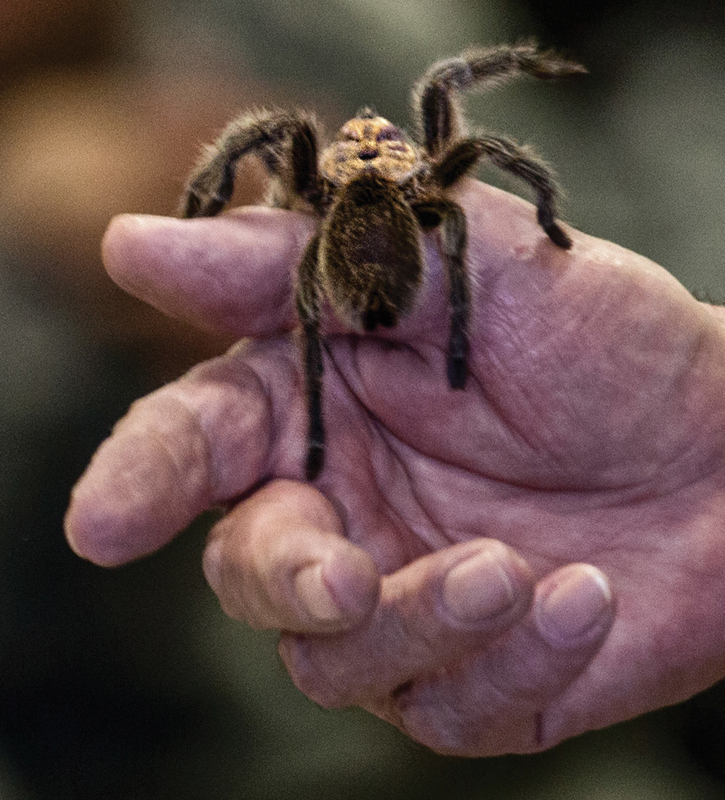 A session on animal and plant life includes a close-up of a tarantula. 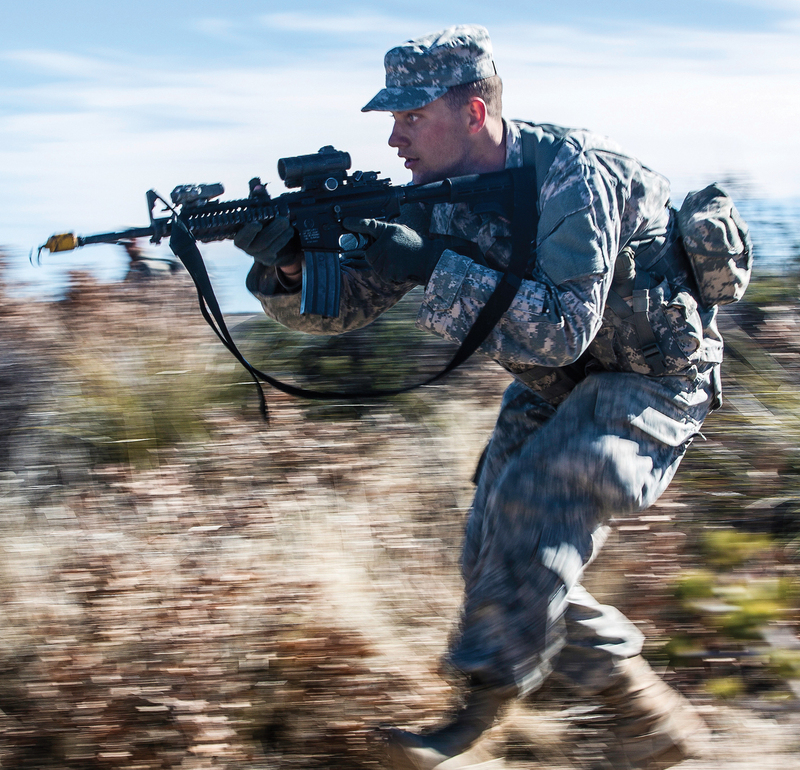 A student charges across the range at Fort Bliss, Texas. The challenge now is to deepen the foundations and broaden the reach of desert training, which has strong backing from Maj. Gen. Stephen Twitty, commander of the 1st Armored Division and Fort Bliss, and Lt. Gen. Sean MacFarland, commander of Combined Joint Task Force-Operation Inherent Resolve in Iraq and III Corps and Fort Hood, Texas. “The course is going extremely well and has proven very effective at enhancing the leadership skills, confidence and small-unit tactics proficiencies of our junior NCOs,” Twitty said. However, Twitty is scheduled to depart Fort Bliss this summer, and the course still doesn’t have a dedicated funding stream. Instead, it is supported out of 1st Armored Division discretionary funds. Also, all students to date have come from Fort Bliss itself, in class sizes ranging from 25 to 32 soldiers although up to 56 can be accommodated. 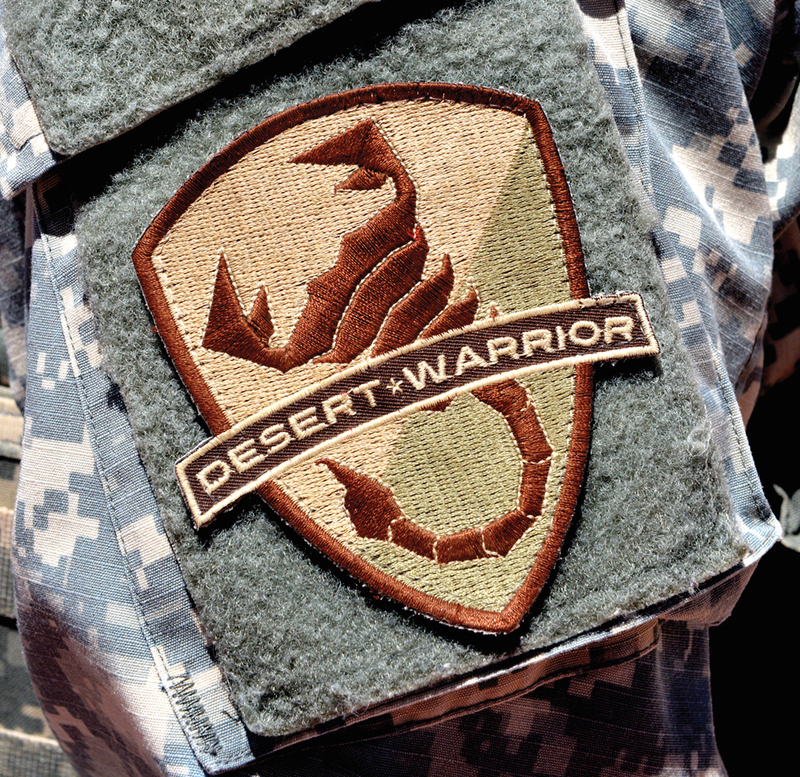 This uniform patch identifies a Desert Warrior Course Graduate. Students form a security perimeter. The ultimate selling point of the Desert Warrior Course is that it can give small-unit leaders a sharper, tougher edge in the harsh, forbidding environment that likely will remain the Army’s focus for a long time to come, Woodberry said.